Construction was recently completed on the multi-phase project which took a major intersection within Montgomery County from 3-lanes to 9-lanes at the largest point. Already a highly traveled area in the county, a new adjacent development was driving the need for improvements at a large scale. The project area is populated with many retail establishments, restaurants and homes. All of these stakeholders would be impacted by the development that included a Costco, Kroger Marketplace, Cabella’s and additional outparcels with smaller retail and restaurant space. 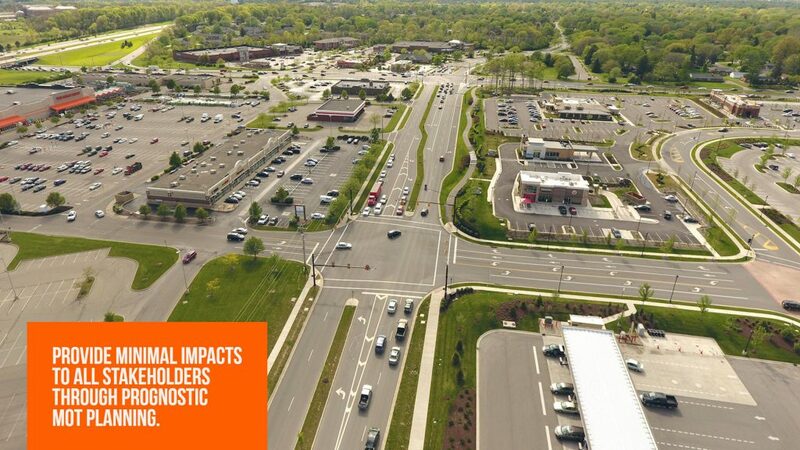 The Kleingers Group worked closely with the City of Centerville, homeowners, business owners and other stakeholders to ensure the design would meet increased traffic capacity needs, accommodate pedestrians, and help keep area businesses operational. Below are examples of things to consider when planning your next large-scale complete-streets, roadway design project. Maintenance of traffic (MOT) in any roadway project can make or break the businesses affected during construction. Kleingers found challenges throughout the three phases of the project, but worked to address or even predict each one. Number one, the entire project scope (all 3 phases) was designed early in the process to ensure that each end of the project would have the least impact on right-of-way, and ultimately the existing businesses along the design. 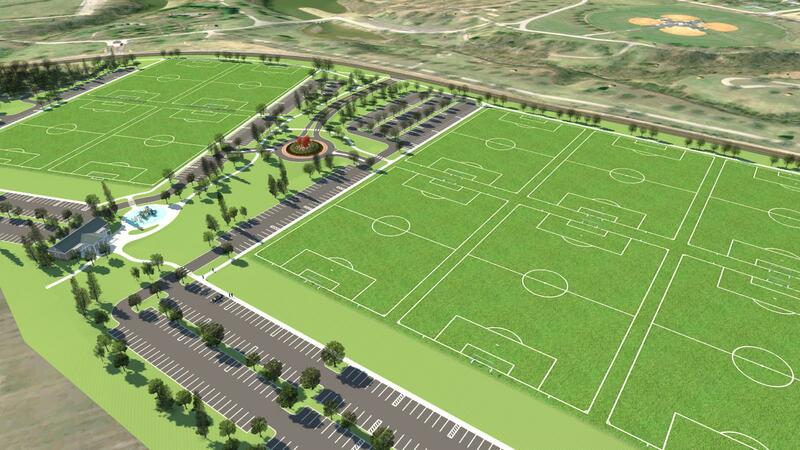 Creating this initial master plan allowed our engineers to create a design that provided no disruption to the area businesses. For some businesses, losing parking spaces could mean closing its doors. Because of Kleingers’ universal look early in the design process, no parking stalls were affected during construction or lost after completion of the project. Kleingers’ worked with the city to help predict future phases and affected areas to ultimately help save money. Speaking of saving money, and resources… Kleingers’ carefully coordinated plans to help save on temporary paving costs by salvaging pavement from other phases of the project. The salvaged pavement was used to reduce construction costs where temporary pavement was needed for maintaining 2-lanes of traffic. Not only was the area already highly populated, but the thoroughfare was an important route for nearby hospitals and other emergency crews. Kleingers coordinated with local hospitals, the city and its emergency services departments to ensure 2-lanes would remain operational during the life of construction to so that emergency crews could operate, business as usual. Complete streets are defined as ‘streets for everyone’ and ‘a means to make it easy to cross the street, walk to shops, and bicycle to work.’ The Wilmington Pike and Feedwire Road project was designed to address safety for all travelers beyond motorists, including: pedestrians, bicyclists and transit riders. 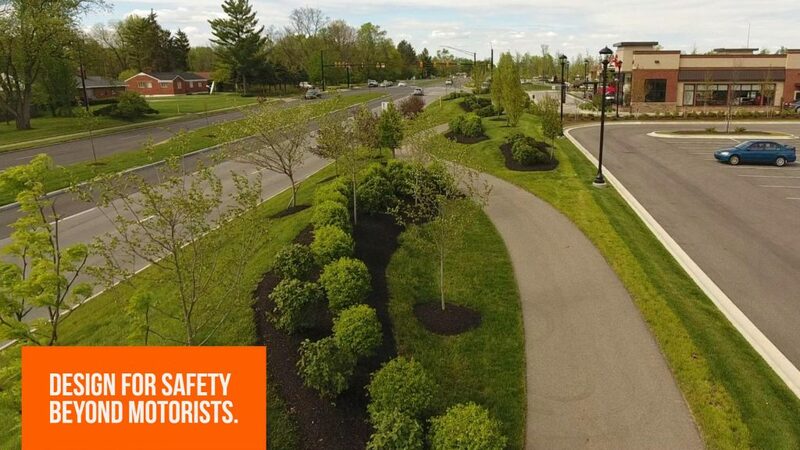 With traditional sidewalks provided on one side, 8-foot wide meandering paved trails and a concrete bus stop for Dayton RTA riders, the project was challenged with not only creating the means for safety, but also creative drainage solutions. Our traffic engineers took into account ADA and pedestrian safety when designing for three traffic signals along the project. The design provided key elements such as: voice activated pedestrian push buttons that are timed and integrated with the signal system; ADA curb ramps; and landscape mounds along the development which obstructs headlights that beam into on-coming traffic. The project also incorporates a pull-off bus stop for Dayton RTA riders along with ADA access and a gazebo that protects transit riders. All of these elements working together provide safe access for pedestrians and bicyclists in the area. The city looked to Kleingers to help find the balance of economics when comparing adding more right-of-way (ROW) costs or providing environmental and water quality structures to address drainage design. Typically, on most projects where adding more ROW to a project has little impact on local businesses or home owners, the simple solution is to create larger ditches to handle drainage runoff. In this particular project where the project was constrained by several existing businesses, the cost-effective solution to drainage was to add water quality structures. In doing so, the designers were able to also address environmental concerns while maintaining precious ROW. 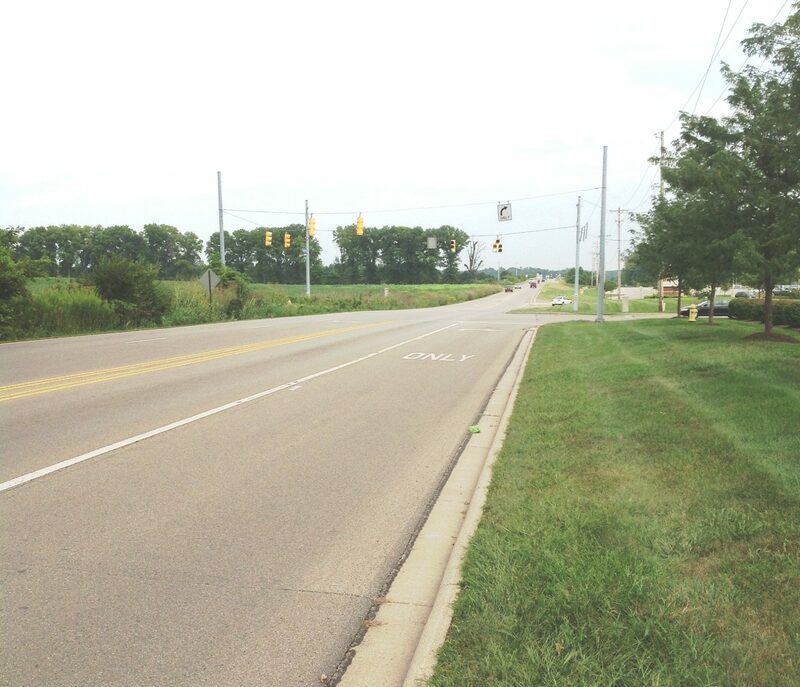 Roadway engineers are continually looking for ways to improve vehicular and pedestrian safety. A rare, ‘out-of-the-box’ solution for drivers who want to safely cross or make a U-turn on a divided roadway is through the use of a ‘Loon through-turn’ design. So, what is a loon? The loon is pavement which is constructed outside of the normal traffic lane within the right-of-way space. 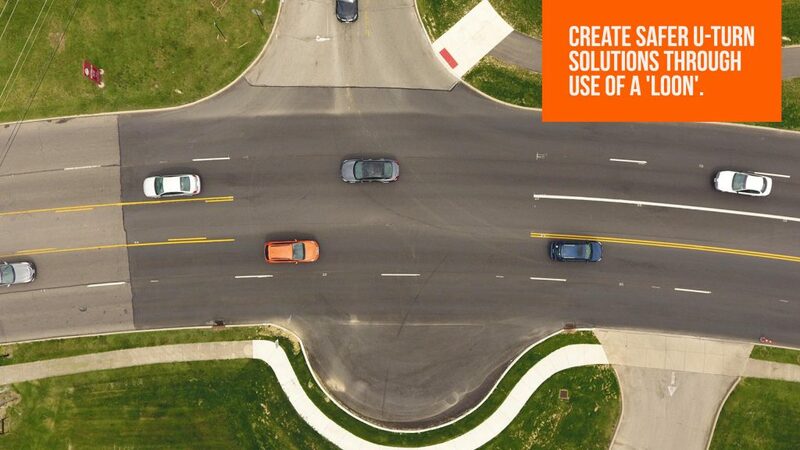 This additional area allows vehicles, especially larger ones, to safely make a U-turn on a roadway divided by a median. Where lanes were widened to accommodate the increase in traffic, a median was created to provide safer access for those who live along this stretch of road. The installation of the loon helps those who are headed northbound access their homes on the other side of the new median without the safety implications of crossing large amounts of oncoming traffic. Often, unforeseen construction issues are a leading contributor to increased construction costs during a project. Kleingers considered all aspects of construction coordination between project phases when designing the roadway improvements, such as: drainage, utility coordination, elevation changes with a neighboring development project and much more. The Kleingers’ team was able to provide contractors with finished elevations for coordination of major utilities, including: watermains, gas mains and power distribution lines. By telling contractors exactly where to locate lines, even in areas that had not been graded for elevations, those utility contractors could be on site once during the life of the project without additionally impacting the schedule later in construction. It also meant that site contractors would have to grade the site less and fewer materials would be required, ultimately saving time and money. By working alongside the designers for the adjacent site development project, The Kleingers Group could provide regular updates on a continuous basis. Adjusting for site elevation, drainage, and utility changes during the project’s design phase. This allowed for Kleingers to maintain continuous control of the project while in the field. This extra coordination helped Kleingers quickly accommodate for construction surprises in the field, helping to alleviate downtime on the project. In summary, a successful large scale complete street project will require close coordination among all stakeholders during the design phases to mitigate common budget and schedule busting events.